An Assembla "Space' is a team workspace, typically representing one project. 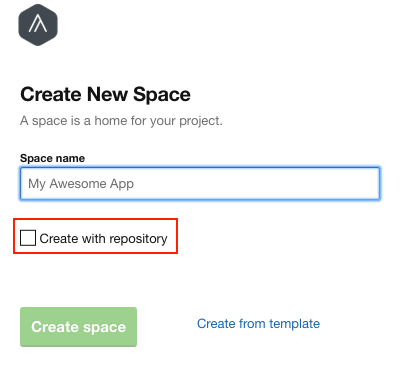 In a space, you could do all sorts of things from tracking your team activity, brainstorming for new ideas, planning and deploying releases, managing code, managing your team, to communicating with your customers. 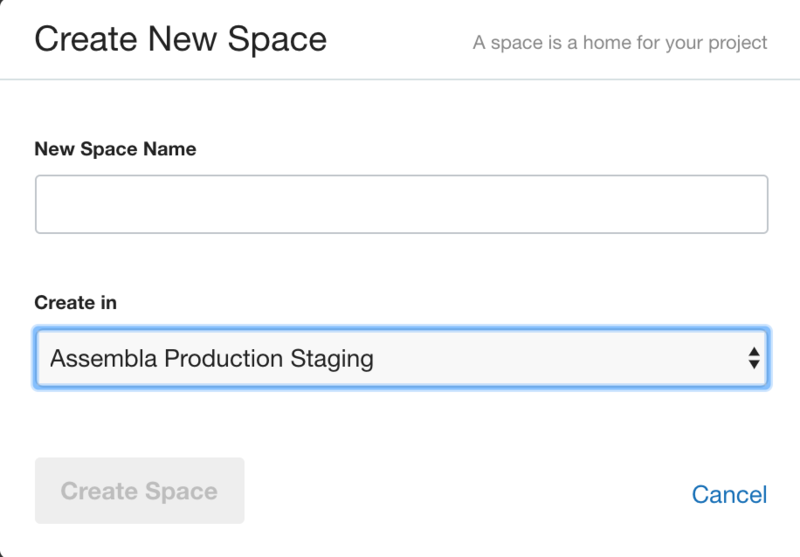 All spaces will have team and stream tools pre-installed, but if you want to add any other Assembla Tools to the space, visit the Admin-Tools page (go to your space -> select the 'Admin' tab -. select Tool). You could set up as many or as few spaces as you want. After login, navigate to your start page (https://app.assembla.com/) and click on the green (+) button and then “Create New Space” to bring up the window below. 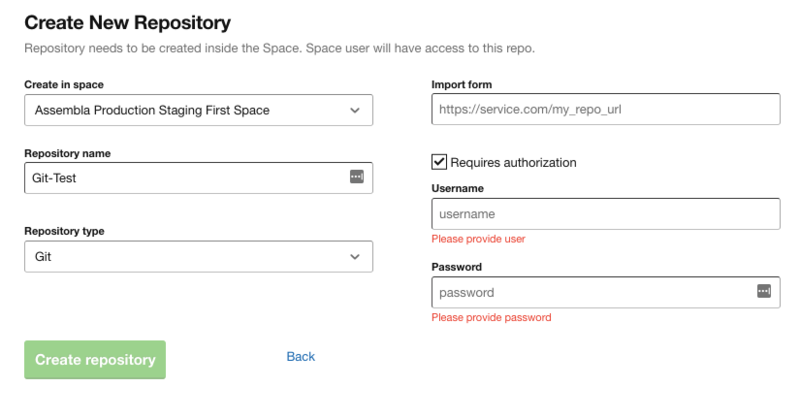 If you would like to add/remove repositories or tools to your Space at any point, please go to your Space's Admin > Tools page. You can do so by going into your Space, clicking the Admin tab, clicking Tools, and clicking on the 'Add' button next to the tool you would like to add. How to Configure and Customize Your Space? 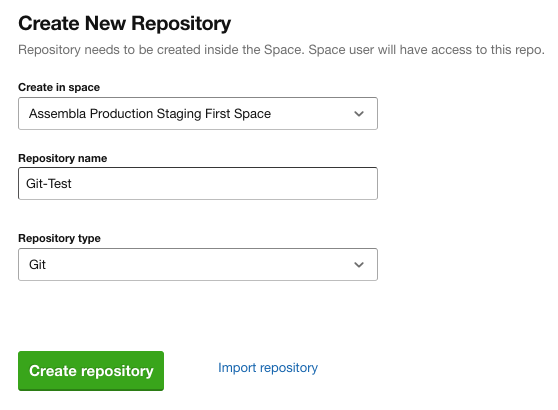 You can configure and customize a space if you are an owner/payer of the space (you can check your role by going to the ‘Team’ tab). You could also edit the space if your user-role has access to ‘ALL’ permissions (you’ll know if you could see the ‘Admin’ tab). Keep in mind that when you change settings as an ‘Admin,’ you are changing the settings of the space for the whole team. Go to the ‘Admin’ page of your space. It should look like the image below. In this page, you could easily add or remove any Assembla Tools to your space as desired. In this page, you could change the name and url of your space, change the looks of your space, change the ordering of your Tabs in the Navigation bar, and change the landing pages for your team. In this page, you can set the custom permissions for ‘Team Members, Watchers, and Non-members.’ For each user-role, they will have the permission to either Edit, View, or All (Edit and View). These are the recommended settings and the users that we kept in mind, when creating the roles. Team Members (Edit): People who have work to do on the project(s) in the spaces. They can edit most aspects, but do not have the power to delete things. Only the ‘owner’ of the space can delete things unless you choose ‘All’ permissions here. Watchers (View): The set of people like clients, investors, or other people who want to see your work, but may not have an Assembla account. They can see your work, and can submit tickets for bug fixes or feature requests. By default, new users will receive some email alerts. The Email Alert Setting option in the Admin page controls the alerts users receive when they are first invited. Every user can change his alert settings by going to the Stream-Email Notifications page in the space. Set email alerts for events you think will be important for your team to hear about.